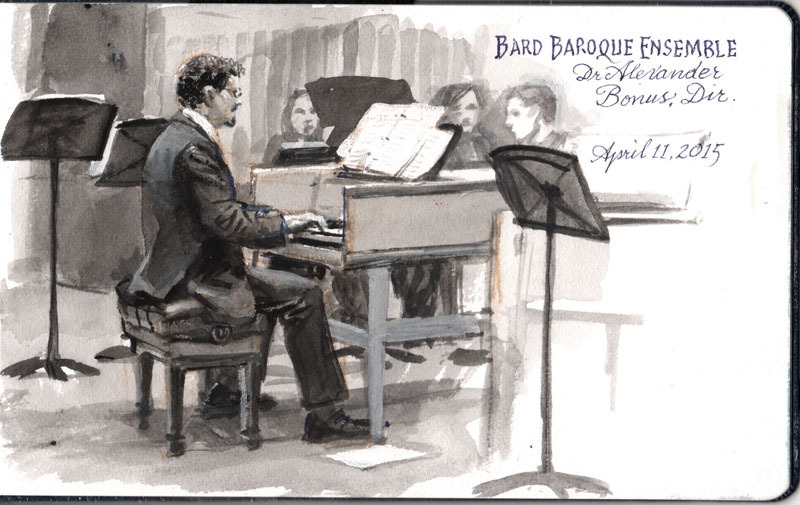 Last night we heard a concert by the Bard College Baroque Ensemble in Annandale-on-Hudson, New York. 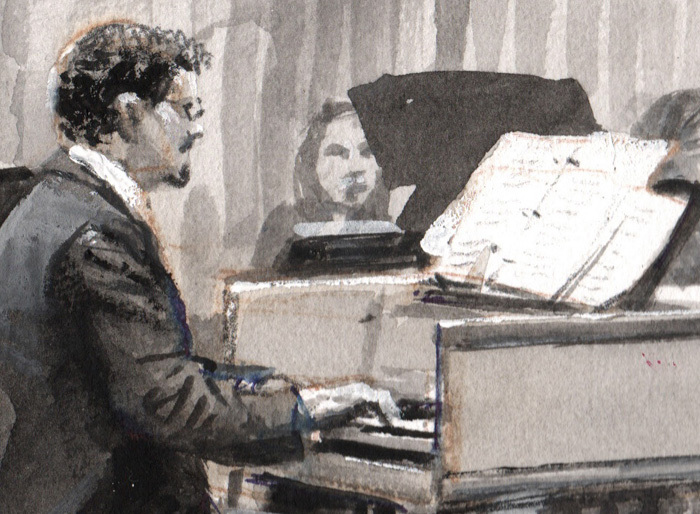 During the performance, I painted the director Alexander Bonus seated at the harpsichord. I was sitting in the second row, with a small watercolor set clipped to the left side of the sketchbook. I got all the materials ready before the music started so that I wouldn't have to fumble around for gear. Guessing that the house lights would be turned too low to judge color accurately, I opted for black and white gouache over a lay-in in ochre watercolor pencil. This detail is about the size of a business card. Always love to see these sketches. This is a real gem. I swear you're getting better and better :^). I especially like the subtle color that the ochre under-drawing imparts. I don't exactly know why, but I've always liked two-color illustrations. (I think it has to do with nostalgically remembering old textbook illustrations. )This gives me that same warm feeling. Thanks, Allen and Tom. I have fond memories of those two color illustrations, too. I even tried making some in my graphic arts class. The old Highlights magazine, and the Readers Digest novels used those, too. It always conveyed the feeling of a cut-rate publication, but sometimes they were really good. They used the weird mint green or ochre or peacock blue or vermilion-pink as the second color. Hi Jim, I'm still working on your portable watercolor tripod outdoor set up, and having trouble finding 'resistant hinges'. Can you tell me where you found them - or how to ask for them? First your "Baroque Ensemble" is great! I love the subtle two color illustrations too. Now, my question...On your outdoor watercolor tripod setup...I've tried more than one reputable hardware and they don't seem to know what I'm talking about. Also, a camera shop viewed your video on the making of the second collapsable set up and said you were smart for making the base out of plywood, as his 'base' would only be found on line and it's about $50. He also did not have a 'camera arm'. Did you make that out of plywood also? I'll use a circular saw to 'make' the arm, if that's how you did it. And what kind of 'hinge' did you use on the pendaflex shading unit? Thanks. Hi, Virginia, That sounds a bit frustrating. Yes, I made the "camera bar" out of plywood using a saber saw and a vertical sander. The hinged gripper is made of two pieces held together with a tiny hinge. The Southco adjustable torque hinges are not in every hardware store, but there should be links to Amazon on "Watercolor in the Wild Materials."